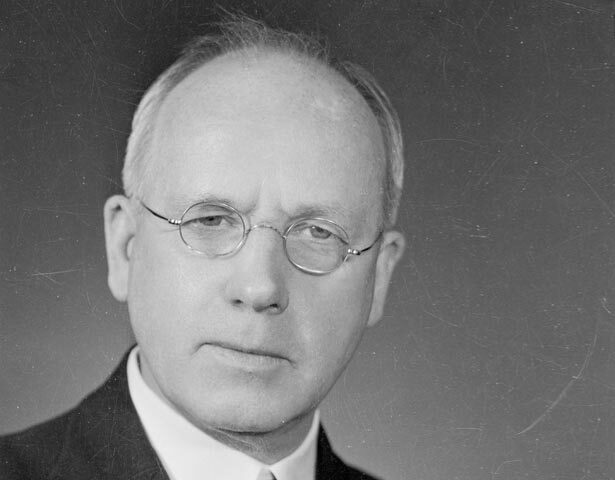 Peter Fraser, New Zealand’s wartime PM, led the nation for a decade. Respected, rather than loved like Savage, he is rated by many experts as our finest PM. Fraser’s eyesight was never good, but it withstood a lifetime of heavy reading. He came to New Zealand in 1910, and cut his teeth in trade unionism. By 1916, when the Labour Party was formed, he was more interested in parliamentary politics. After being gaoled for opposing conscription, he entered Parliament in 1918 for Wellington Central, which he held until his death. A year later he married Janet, a true partner, whose ideas influenced his own. A devastating debater, Fraser worked with Walter Nash to move Labour from socialism to humanitarian welfare. As Savage’s deputy, he was a reforming minister of education and health. When Savage died the country was at war, and not doing well. Although Fraser briefly considered sacking General Freyberg, commander of our main force, after the reverses of Greece and Crete, he kept him on and they became close friends. Many admired Fraser’s stoicism in the face of reverses. Fraser fought alongside Britain, but without subservience. The ‘Freyberg Charter’ required Britain to consult New Zealand about the use of what was effectively its national army. Later he fostered national identity by developing the arts. His government established diplomatic relations with the United States, signed the 1944 Canberra pact to protect Australasian interests in the Pacific, and played an important part in establishing the United Nations. In 1947 Labour ratified the Statute of Westminster, which earlier governments had refused to do, gaining legislative equality with Britain. Not afraid to put country before party, he persuaded Gordon Coates and Adam Hamilton to join a War Cabinet. After the war he alienated many in Labour by advocating compulsory military training. Fraser helped settle longstanding Taranaki and Ngai Tahu land claims in 1944, and in 1946 played an active part in a settlement of the Waikato confiscation claim. His most important achievement in the field of Māori affairs was the Maori Social and Economic Advancement Act 1945, which allowed some Māori involvement and control over welfare and other assistance. Janet’s death in 1945 was a blow to a man as exhausted as his party. Labour barely won the 1946 election and this slightly stooped, worried-looking man died a year after losing office in 1949. Fraser had his quirks. Authoritarian, devious and secretive, he worked punishing hours, was disorganised, conducted too much business orally and was addicted to attending funerals. We have 3 events in history, 40 biographies, 28 articles, related to Peter Fraser.